Like most enthusiasts, Craig Mauel’s tastes have evolved over time. 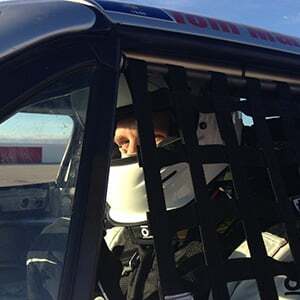 Now a DoD contractor living in Jacksonville, Florida, Mauel has been a fan of Ford’s pony car since his youth, but his core game plan for performance changed as the years passed. In 2003, Mauel made that dream a reality when he scooped up a 1999 GT. While he was excited to finally have the keys to his own V8-powered Mustang, he admits that it wasn’t really a standout example when he took delivery. “It was nothing special – cloth seats, a five speed gearbox, no hood scoop, 16-inch pony wheels, and white stripes,” he says. Aesthetically, Mauel’s car draws inspiration from both the Saleen S-281 as well as Ford’s own SVT Cobra model from the same era, but with a decidedly more drag-focused setup than either of those models. Today his 1999 GT bears little resemblance to the unassuming low-option coupe he snagged all those years ago. Crucially, it also has the performance to back up the aggressive look. Here’s how it all came together. An SVT Cobra brake system clamps down on Brembo rotors up front, helping Mauel bring the car back down from quarter mile speeds this GT would never have been capable of achieving in its stock configuration. Along with the H.O. Fibertrends cowl hood, Saleen S-281 body kit, Saleen S-281 rear wing, Mauel’s GT sports a set of 17-inch Weld RT-S S71 wheels wrapped in drag strip-focused rubber. Turning our attention to the chassis, Mauel bolstered the Mustang’s braking capability by swapping out the GT’s front brake components for the setup from a 2003 Mustang SVT Cobra, which clamp down on 13-inch cross-drilled and slotted Brembo rotors. Mauel says he has two sets of rear tires for the car, one for the street and another specifically for doing work at the drag strip. The street setup uses Mickey Thompson ET Street S/S rubber measuring 315mm wide that’s wrapped around 17×10-inch Weld wheels, while the drag setup consists of 275mm Mickey Thompson ET Street Radials with 15×10-inch versions of the same wheel. The suspension has seen its fair share of attention too, with factory K-member and A-arms replaced by PA Racing tubular hardware, while Strange 10-way single-adjustable struts are paired up with Strange 12-inch 150-pound coilover springs. Out back TRZ Motorsports supplies the double adjustable upper and lower control arms, Viking double-adjustable shocks are matched up with Viking 12-inch 150-pound springs, and a TRZ Motorsports spherical bushing setup replaces the factory rubber pieces. 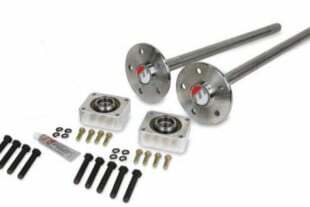 Maximum Motorsports’ full length weld-in subframe connectors are also on hand to bolster chassis rigidity. The cabin of Mauel’s GT is all business, with Kirkey Pro Drag race seats and RaceQuip harnesses keeping occupants in safe and secure during passes down the drag strip, while the rear seat has been tossed for weight savings with a custom seat delete kit. Though the GT’s cabin is down on creature comforts with the air conditioning and rear seats now absent, it makes up for it in performance focus and occupant safety. A six-point roll cage stiffens the chassis while meeting NHRA requirements for Mauel’s expected ETs this season, while a host of gauges keep him apprised of the engine vitals at all times. Engine vitals are monitored by way of an AutoMeter Lunar series instrument cluster, an AutoMeter Lunar series Monster tachometer, an AutoMeter boost gauge, an AutoMeter coolant gauge, and a PLX Devices DM6 wide band gauge. A Maximum Motorsports six point roll cage with swing out door bars brings both chassis rigidity and an added measure of safety. “I added a cage last year to make the car NHRA legal to 10.0, and hoping to see some deep 10 second runs with the newest setup,” he notes. As with the rest of the car, over the years the power plant installed in this GT’s engine bay has gotten progressively more radical. The current setup is a built four-valve mod motor from a 2003 Cobra with Wiseco pistons, Manley rods, MHS Stage 3 camshafts, MHS Stage 2.5 cylinder heads, and a V7 Vortech JT-trim blower putting out 15psi of boost at maximum. The combination is good for 632 horsepower and 542 lb-ft to the pavement. Fast forward to today and the car is now sporting a fully built four-valve motor sourced from a 2003 Cobra. “The engine failed a leak down test and was torn apart to discover that it had fried seven of the eight pistons,” he tells us. “I took the entire longblock to Excessive Motorsports/Modular Head Shop in central Florida for a full build including better pistons, higher compression, ARP everything, TSS billet oil pump gears, ported heads, valve job, bronze valve guides, and replaced valve seats. The longblock also received MHS stage 3 blower cams and I sold the S-trim to buy the JT-trim. I also added a Cobra Engineering head cooling mod for the extra insurance. I have basically addressed every common issue that Terminator owners face.” The current setup is now churning out 632 horsepower and 542 pound-feet of torque at the wheels. In 2012 Mauel also swapped out the Tremec T-45 gearbox for a T-56 unit after the horsepower started to exceed what factory transmission could handle. “Since the car will now see more track time, a 4R70W is currently being built with full manual valve body and trans brake,” he notes. Mauel’s commitment to his project has resulted in something wholly different from where it started all those years ago. With the expectation of more power and quicker ETs in the upcoming year, it doesn’t sound like he’ll be done with it any time soon either. These days Mauel’s GT is anything but a garden-variety Mustang, and folks are taking notice. Along with scoring a Muscle Mustangs and Fast Fords Editor’s Choice award and being featured car in Mustang Driver magazine, Mauel says the car has amassed a number of local car show trophies in recent years, most of which have focused on that potent mill nestled in the engine bay.